Sunday had something of a bittersweet feeling, as it was not just my final race of 2014, but the culmination of a hell of a year. 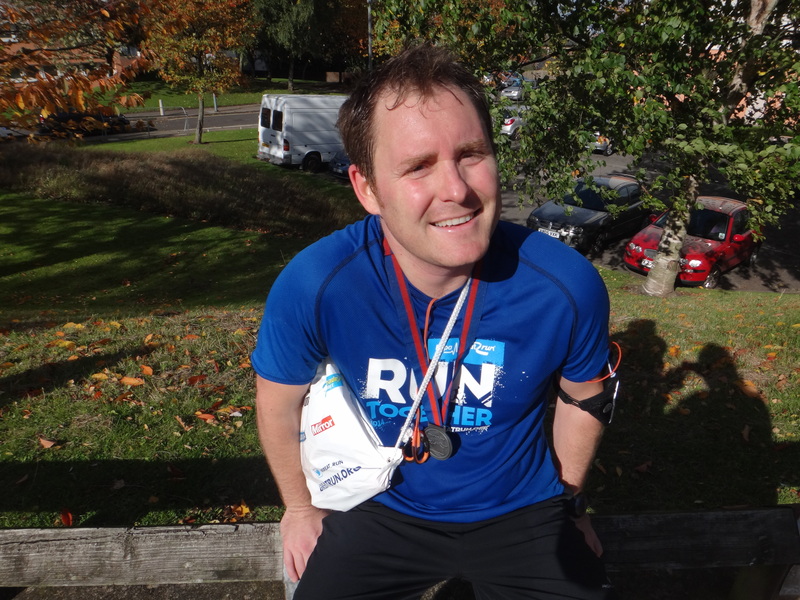 This was my second consecutive Great Birmingham Run, which unlike most of the others I have completed this year meant I actually knew what to expect for most of the course, and it did help out a lot. In particular the dreaded hill section (around miles 10-12) which although it still hurt a lot, I was more prepared this time around to conquer it. I spend the day before getting into the zone by watching back-to-back Dark Knight movies: something about the music really helps me psyche up, and I took this all the way through by listening to the soundtrack on the way to the race (the Hans Zimmer one rather than Prince!) and watching Gotham afterwards! In fact I actually ran most of the course alongside a guy dressed as Batman, accompanied as always by Robin, Bananaman and … er Luigi! Things started well in the build up area when I spotted a Soreen van with samples of my favourite malt loaf. Much to the embarrassment of my long-suffering wife who had kindly come along to be my supporter/driver/ photographer/kit carrier, I then attempted to fill my bag with as many free samples as I could to ensure I won’t need to worry about my mid-morning work snack for the rest of the month. I even got a photo outside it, although implore you not to stop reading just because of this. I will be writing more about my take on sports nutrition soon, but all I will say for now is this is about as good as you can get during longer distance races. After a week of not being able to train outside due to rain, and with Hurricane Gonzalo due to reach us just days later, I don’t think anyone had expected it to be sunny. I hold my hands up here in that is was probably my fault – most of the races I have had this year have ended up being much hotter than planned, so I guess the sun just has it in for me. Obviously I had not brought sunglasses or cream, so another unintentional Monday morning red face was inevitable. Still, it was better than it raining. As usual there was a great atmosphere around the course, and it was great to see that the official starters were two of my local heroes – Triathlete Jodie Stimpson (see Commonwealth Games blog from July) and Warwickshire batsman Ian Bell – both of whom looked even smaller in real life than on TV. There are so many people in this race that you are split into separate left and right sides, with a staggered start. Unfortunately I ended up on the left which meant having to wait an extra 10 minutes or so before I could get away, so I had a lot of hopping about on the spot to keep warm. Ahh, that brings us to the group warm up – Something we seem to escape in triathlons, presumably on the basis most people are well prepared for their race, or possibly the fact you start in the water – But I digress. Those who have done similar events may be familiar, a Mr Motivator type guy gets hoisted up in front of the crowd with a banging soundtrack and goes through a series of stretches, squats and general lunacy, to make sure everyone is ready. It is a bit of fun, but I was fairly capable myself, and as mentioned it was another half hour before I actually got to cross the start line. 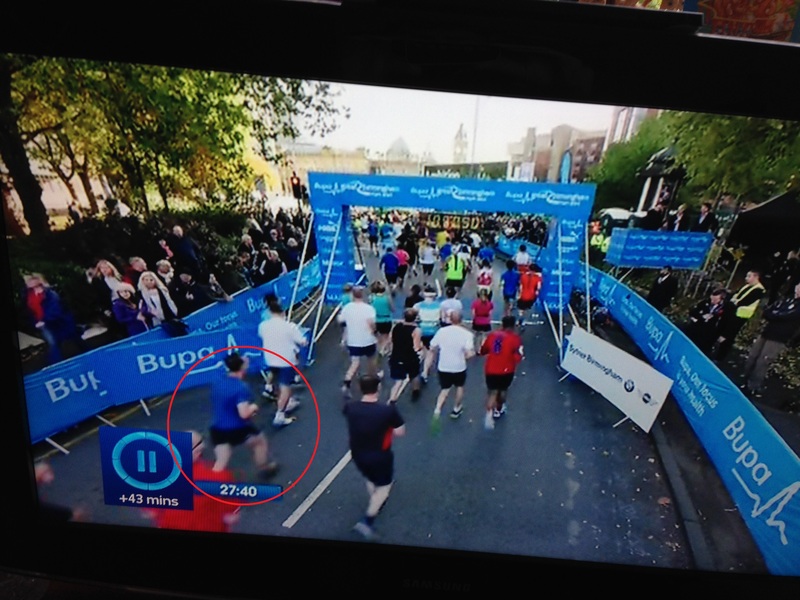 Now the important bit – The whole race was televised live on Channel 5, and whilst most of the focus was on the elites at the front there were a few clips of us real racers, and having Sky+ the whole thing I did what everyone does in such situations and watched it back later to see if I could spot myself. Amazingly I was in the only clip they showed of my wave starting, with real pictorial evidence below (I am circled bottom left). Now I am not quite going to suggest it is going to get me VIP entry anywhere soon, or even time to apply for Celebrity Big Brother (although it probably would qualify me). That said, autographs will be available on request. 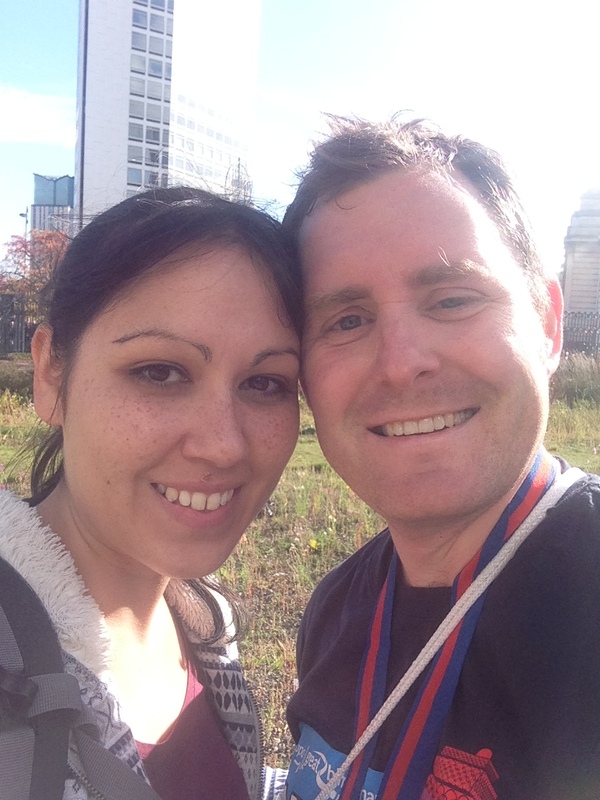 Looking back at my last blog, I had banged on about how much I liked my GPS watch. Obviously this was an ideal time to be using it, helping me work out how fast I was going to pace myself, and more importantly how much further I had to keep struggling on for! Unfortunately this was the one time it managed to let me down: I had expected it to take a while to lock onto satellites, being surrounded by fairly tall buildings and not to mention thousands of others trying to do the same, so I switched on about 15 minutes before the start, but it just would not connect. Even as I crossed the line I still had no luck, and in the end it took another quarter of an hour before it finally worked out where I was. This meant that I had already clocked up 3km: far faster than planned and using up more energy to boot, as well as giving me a bit of mental arithmetic to do working out where I really was. 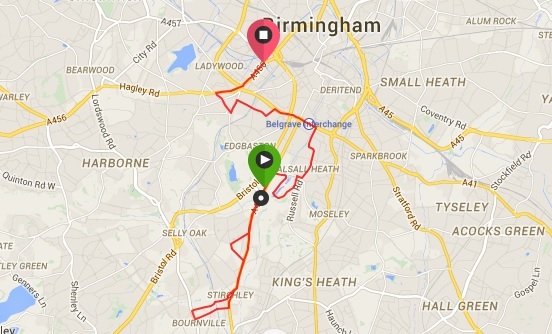 It also messed up the pretty map I have shown below, as I managed to teleport halfway across town from the start line! 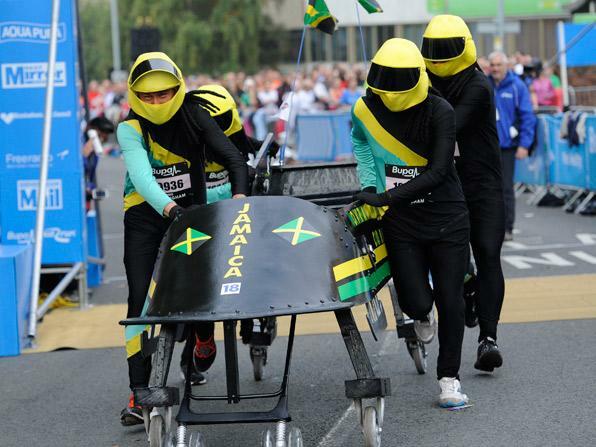 As well as my superhero chums there were plenty of other costumed wonders in this race such as Wolverine & Spider-Man, and even one guy who had a caged gorilla suit like the one in Trading Places, but the headliners in Brum are always the Wolverhampton Jamaican Bobsled team who do this every year in full costume. They start in the first wave and I guess the early downhill plays into their hands, but I assume Sanka is on brakes and slowing them down, as I caught them up around the same time my GPS found me. Fair play for the commitment though, as I would not have wanted to wear this get up in Sunday’s weather. 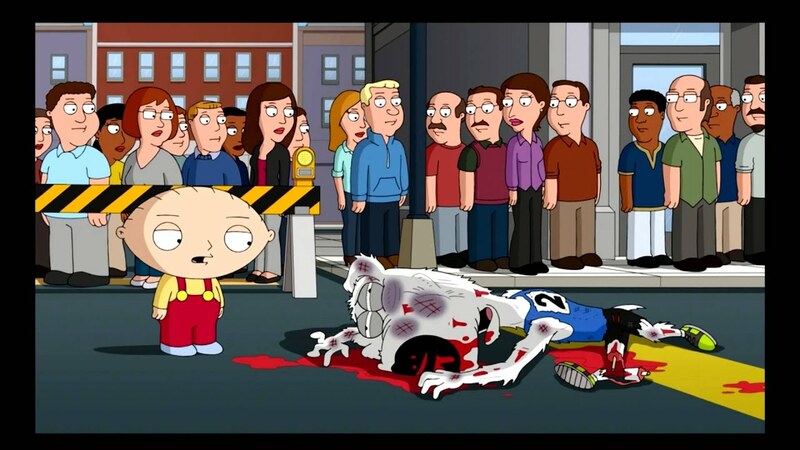 I suppose I should say a few words about my own performance in the race. It is a road course, and it is hard to get too lost or really do anything unusual. The biggest difference between a running race and triathlon is you are allowed music and headphones which is great for motivation (power song was Noots by Sum 41), but as just about everyone else has them you don’t get quite as much interaction / banter as in a tri. On the other hand, with 20,000 participants you are a lot more squashed together so at least this is not quite as lonely (as say the Avenger when I spent nearly an hour without seeing anyone). A word needs to be said about the support for this event though, as it is fantastic. The race goes through a lot of residential areas, and there were tens of thousands of people out and about, cheering us on, and even offering drinks and sweets to keep people going. It really is the best part of this race, was enough on its own for me to have done it again this year. And the hill. As mentioned it is the one part of the course everyone talks and worries about. The TV commentary describes this as one of the toughest half-marathons on the calendar, which is a surprise as you would not have thought of Birmingham as being particularly undulating. There is a small hill just after the 3 mile mark, which this year caused me no trouble, and if the main hill came then it would probably be ok. But it comes after 1o miles, waiting until your legs are already well and truly shattered before rearing its long neck and finishing you off. But this year I was prepared, or so I thought. I managed to get in a proper sprint finish for the last 200m, which ensured I was able to dramatically collapse into the barriers immediately after crossing the line, but I am sure only a few hundred people saw me so I probably got away with it. And that was it – my final race of 2014 completed, three minutes faster than my previous time- and leaving just a few short months of training to complete the remainder of the Chile Challenge. That is assuming my legs ever recover, as two days later I am so stiff I still can’t climb up the stairs properly…!